Figure 1. Side View of Normal Uterus. Patients we see in consultation often have heavy menstrual bleeding and pelvic pain. The large majority of these women have uterine fibroids and we are known globally for the non-surgical treatment of these benign tumors. However, some women who have these same symptoms do not have fibroids at all (even though a number of these women have been misdiagnosed as having fibroids). These women have another benign condition called adenomyosis. To understand adenomyosis, one needs to first understand the layers of the uterus (Figure 1). There are 3 layers of the uterus: endometrium, myometrium, and perimetrium. The endometrium is the innermost layer which is in contact with the uterine cavity. It is the thin lining that sheds every month with a woman’s menstrual. The myometrium (muscular portion) makes up the vast majority of the volume of the uterus and responsible for the uterine contractions. The third layer is the outer thin covering (serosa) of the uterus. When cells from the uterine lining (endometrium) are found completely outside the uterus it is called endometriosis. Endometriosis is a common condition which often causes pelvic pain and even infertility. When the endometrial cells penetrate in to the myometrium it is called adenomyosis (or internal endometriosis). This causes the uterus to enlarge and feel hard on physical exam (just like fibroids). 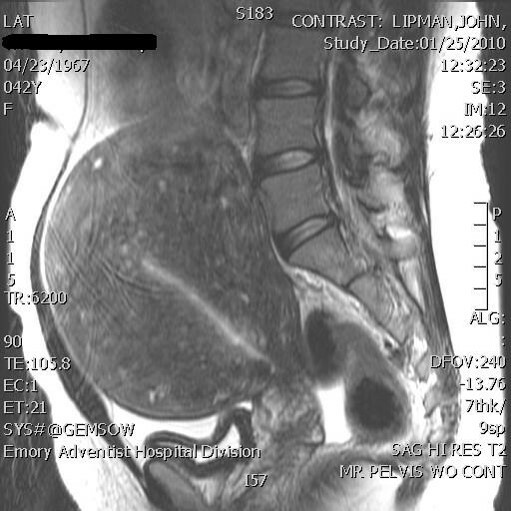 Adenomyosis has 2 forms: the more common diffuse form (figure 2) and less common focal form (adenomyoma, Figure 3). A number of women adenomyosis also have endometriosis and vice versa. They can also have fibroids too. As mentioned previously, the main symptoms of patients with adenomyosis are similar to fibroids (pelvic pain and heavy menstrual bleeding). However, typically for patients with adenomyosis the pain is worse than the bleeding whereas with fibroids, it is typically the reverse (i.e bleeding worse than the pain). Fortunately for women who want to avoid surgery, Uterine Artery Embolization (UAE) is an effective therapy for adenomyosis (as it is for uterine fibroids).1,2 The mechanism of action is also similar. 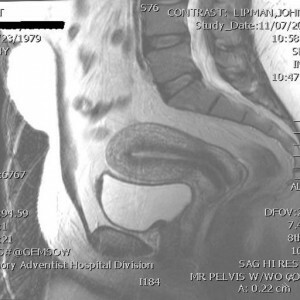 When the blood flow to the treated area of adenomyosis is interrupted, that area will shrink in size leaving behind a much smaller non-enhancing cavity seen on follow-up pelvic MRI exam (Figure 4). 1. Popovic M, Uterine Artery Embolization for Treatment of Adenomyosis: A Review. JVIR 2011; 22:901-909. 2. 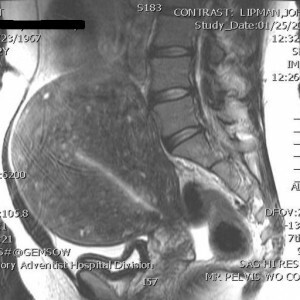 Smeets AJ, Long-term follow up of UAE for Symptomatic Adenomyosis. CVIR 2012; 35(4):815-819.